I recently deployed a new vRealize Automation 7.5 environment. The deployment went without any issues. The configuration also went well. A week later, the console of the vRA appliance was launched and an error was displayed. The error indicates that the vRealize Automation deployment failed. This was an odd error to see as the environment was up and running for well over a week with no indication anything was wrong. I searched the web and found one reference to it on the VMTN communities forum. A VMware employee had responded. They said to reboot the virtual appliance and ensure the services all registered after the reboot. If all was well, then to edit a welcome text file to remove the error. 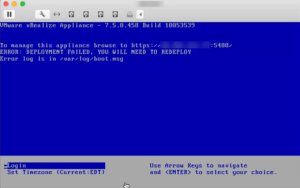 The error in the boot.msg file was Failed services in runlevel 3: network vcac-server. Slightly different than the service in the VMTN post. I rebooted the appliance and confirmed the services registered correctly. The VMware employee indicates that a knowledge base article is being created for this issue. I will edit this post with an update to the KB when available. Thanks for this blog post. We ran into this same issue when deploying a fresh vRA appliance. All services are running fine but the error message shown is a little worrying.